Hi friends! It’s been a while. What have I been doing? Working, making lots of trips to Home Depot, and a little bit of travel in between. This year is off to a busy start! This past weekend I busted out my juicer again to make use of all of the extra fruit I have around. Since I live in Los Angeles, it is pretty much mandatory that I own a juicer. Aside from the fact that you might ingest too much sugar if you make a purely fruit juice too frequently, I love experimenting with new juices and find that they make a great post-workout treat. After participating in Cycle for Survival (click here to donate to this awesome cause) and a trip to Home Depot (of course), I recovered with this refreshing juice. If you don’t have a juicer, you can try putting everything in a blender and then using a strainer to get rid of the pulp. Peel the citrus fruits before juicing, but you can throw the apple in with the skin on. It felt like summer here this weekend. Sorry to those of you reading this on the East Coast… This would’ve been perfect to enjoy on the beach or by a pool. This juice was just sweet enough and the ginger added a bit of a kick. Side note: I’m obsessed with these cute heart paper straws. Target gets me every time. Throw everything into the juicer, juicing the ginger last. Juicing is quick, easy, and healthy. Perfect combination. Enjoy! 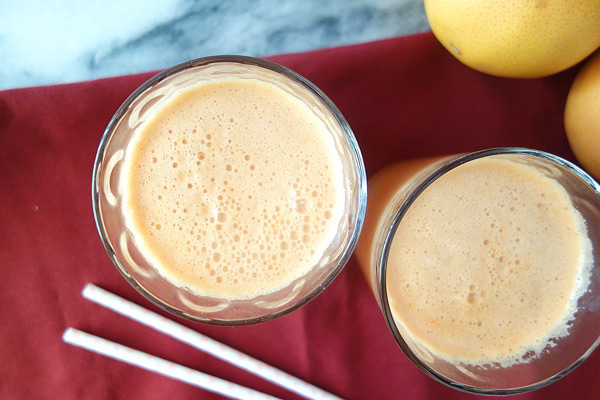 Peel grapefruits and oranges and slowly add to juicer. Cut apple into large pieces and add to juicer. Add celery stalks to juicer followed by fresh ginger. Serve immediately, adding ice if needed.